On Wednesday this week (19th June), Science is Vital presented our report on the legacy of the 2010 Comprehensive Spending Review to David Willetts, Minister of State for Universities and Science, in his office in Westminster. The report, which summarised our survey from scientists around the UK (and some who had left to work abroad) gives a vivid, ground-level snapshot of the effects of the 2010 freeze of the UK science budget. 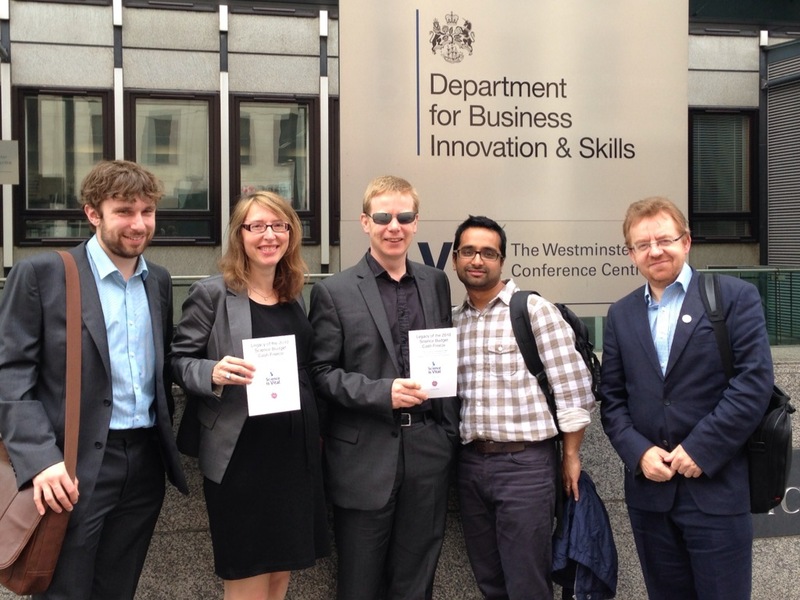 Five members of the Executive Committee—Jenny Rohn, Stephen Curry, Richard Grant, Andrew Steele and Prateek Buch—met with the minister and Dr Graeme Reid, Head of Research Funding at BIS, to discuss the report and the future prospects for UK science funding. Although the meeting was private and we can’t go into details, the discussion, which lasted for almost an hour, was frank and generally positive; it was clear that both Mr Willetts and Dr Reid had read the report and took its findings seriously, and they provided some useful insights into the processes of government. We were glad to have the opportunity to emphasise the report’s key messages, and to reiterate our recommendation of setting clear targets for future R&D spending as a way to boost confidence in the long-term among researchers and potential industrial investors. It was a healthy continuation of a dialogue that started in 2010, and that both Science is Vital and the minister look forward to continuing beyond the announcement of the details of the current spending review next week. A Times graph (17/06/14) shows the scientific world standing of UK 15 yr olds declining from 5th in 2000 to 20th in 2012. Government attitudes to science and technology is evident in the closure of the world class Forensic Science Service in 2010 and the sale of BNFL’s nuclear build facility to Toshiba in 2006. A new UK nuclear power station will now be built by EDF who have the UK across a barrel in terms of cost as the UK has no bargaining position. In 1973 Sir Alan Cottrell resigned his position as Chief Scientific Adviser due to frustration with the inability of the mandarin elite to make rational decisions on technical matters. Lord Krebs was scathing in his report about the Argos attitude he found in the UK government which believed it was better to buy in whatever was needed rather than invest to make it. The issue of the 15 year olds must be a direct consequence of teaching standards and George Osborne’s stance of freezing the science budget at the 2010 level can only sustain, at best, the 20th global ranking.